Oh how fast time flies...it is almost time for the Nine Emperor Gods Festival again, after the Mooncake Festival. The calm of Ampang Old Town will soon be shattered by the arrival of the festival, with its carnival-like atmosphere and the incessant droves of devotees and curious visitors. Last year, I took on the task to post the daily on-goings of the festival from my perspective (Nine Emperor Gods 2011 - a series of continuous posts) and had a great time there. So probably this year it will run along the same line, plus a little something else. 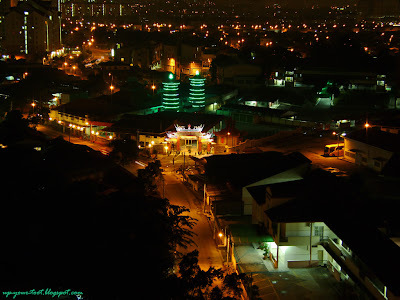 All quite at Ampang Nan Tian Gong Temple (安邦南天宮) - the streets are empty at night and the temple all dark. This photo was taken on the night of the Mooncake Festival, 15 days before the Nine Emperor Gods Festival. The last post for last year's festival is here (Taking Down the Lantern Pole Pt. 2). The Nine Emperor Festival is a folk culture that is unique to this region (Southern Thailand, Malaysia, Singapore and parts of Indonesia). Whilst the festival have the connotation of worshipping of the Northern Dipper Stars (Big Dipper), the practice of vegetarianism, secret invitation of the Nine Emperors and mediums going into trance is not at all a mainstream Taoist practice of honouring the Northern Dipper Stars (禮斗); making this a must see festival for those who want to learn more about local folk culture practices. The picture on the left was taken on the 2nd October 2012 - the workers were putting up the sheds within the compound of the temple (by the open bed lorry). The picture on the right was taken the next day - light blue and lilac arrows indicates the whole row of sheds for the joss-stick stalls and the green arrow points to the extensions for the stalls by the walkway. For those who want to visit the Ampang Nan Tian Gong Temple for the Nine Emperor Gods Festival, the tentative program can be viewed at Cheryl Hoffmann's site - Nine Emperor Gods Festival. Last year she was at Penang, another Nine Emperor Gods Festival hotspot, and managed to capture the essence and the emotions of the festival through her wonderful photographs. Cepatnya masa berlalu. I was thinking the same thing macam baru je baca posting Sean regarding festival ni tahun lepas. Yeah, time really flies. I am looking forward to the stinky tofu and dragon beard candy on sale at the fair. Great to see you posting Sean! I'm going to link this to my blog - okay with you? Love these shots. Sure Cheryl, thanks. The flagpole was given a new coat of paint today at the temple yard and a large number of the flags were up. I will be looking forward to your updates about what's happening in Ampang this year. Ipoh also is full of activities during this festival period. Will surely keep you updated on the ongoings over here. Are you off to the festival in Ipoh? Love to see it on of these days. Drop by the temple for a visit. Tuesday would be packed with the second procession.